Think about the times you have lied about something. Were they little white lies to save face or to protect someone? Was there a big lie that led to another lie or that, once learned, hurt someone deeply or caused a serious trust issue? 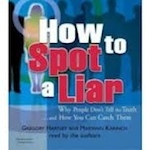 On this episode, Jason Hartman interviews expert interrogator, Greg Hartley, author of How to Spot a Liar: Why People Don’t Tell the Truth…and How You Can Catch Them. Greg explains that on the continuum of normal, there are three reasons people lie: Love, hate and greed. He also says there are people who lie for self-preservation, while there are people who lie for sport to see what they can get away with in life. Greg describes the positions of interrogator and confessor. He mentions there are 14 different ploys that interrogators use that are tied to the ego, love, hate and greed. He also points out body language to look for in liars. One quick tip is if a person seems too perfect, overly accommodating, be wary and trust your instincts. For more details, listen at: www.HolisticSurvival.com. Greg has trained government agencies, private investigators, human resource representatives, and finance experts to read people and detect deception. Hartley has provided expert interrogation analysis for major network and cable television, as well as National Public Radio and prime print media such as The Washington Post and Philadelphia Enquirer . Important foreign media such as BBC, and Der Spiegel have also relied on his commentary. Hartley has contributed to articles for major magazines such as Spin, Cosmopolitan, Marie Claire, and Details. Hartley created simulations of interrogation for British television in Torture: The Guantanamo Guidebook, and for the History Channel in We Can Make You Talk. Greg Contributed to the upcoming movie Neurotypical. More recently Hartley has provided expert analysis of what people are really saying with behaviors and body language for national media like HLN, InSession, Paula Zahn Now, HLN Prime News and Glenn Beck. Hartley has made appearances on countless news programs, local TV, and radio around the country. Greg has extensive experience as an employee in large corporations based in the US and abroad. He has worked as a business consultant to Fortune 500 Companies in the US and consulted to international clients. Greg teaches and consults the use of Extreme Interpersonal Skills© in daily business applications.